Pen & Sword Books Ltd. Pen & Sword Books Ltd. is based in the UK. This book has a publication date of January 4, 2019. It is soft-cover of 65 pages in 11 1/2" x 8 1/4" page format. At the top of the front color there is a color photo of a 1/35th scale Tamiya Centurion Mk.2, Vietnam War model by Brian Richardson. On the left in the center is a black and white photo of Israeli Centurions advancing in the Nagev Desert. Next in the center is a color photo of a Centurion on exercise with the British Army of the Rhine. Constant operational practice with other NATO nations successfully defended the threat from the Warsaw Pact. On the right in the center is a black and white photo of enemy troops are surrendering at gunpoint to a BAOR Centurion during an exercise in Germany. At the bottom is a color profile illustration of a Centurion Mk. 3 "Caughoo" of C Squadron, 8th King's Royal Irish Hussars, Yongdungpo, Korea, February 1951. At the top of the back cover of the book there is a color photo of a Centurion Mk. X that was a uparmoured Mk. VIII, equipped with a 105 mm gun and with an ammunition capacity of seventy rounds. It had a large searchlight. Under it is a color photo of AFV Clubs 1/35th scale Mk.5/26 105 mm gun (NATO) model, assembled by Jean-Vincent Roy. Third is color photo of a Mk. XII, this Centurion entered service in 1955 and was converted to AVRE standard in 1981. At the bottom is color profile shows a tank form C Squadron, 16th/5th Lancers, Operation "Armadillo's" Delight" in the Wadi Msirah area, Radfan, Aden Protectorate. The book contains 18 specially commissioned color profiles illustrating major variants of the Centurion tank. The Centurion fought in the Korean War, the Arab-Israeli wars, the Indo-Pakistan wars and the Vietnam War. The book is a consist account of the design, development and battlefield performance of the Centurion. It contains technical analysis and details of modifications. There are 79 black and white photos and 107 color ones of the Centurion in action. The book also describes how the Centurion's chassis was adapted to take on other roles. The fifty-ton British Centurion tank, developed during the darkest days of WWII, was designed to out-gun the performance of the latest German tanks, such as the formidable Panzer V Panther. 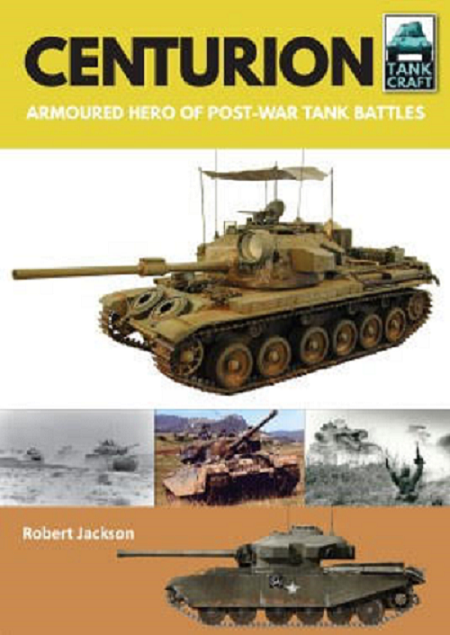 It was one of the more successful tanks ever produced, and this volume in the Tank Craft series, by Robert Jackson, is the ideal introduction to it. The Centurion came into service too late to test its ability in action with German armour, but in the post-war world it earned a fearsome reputation in action during the many conflicts of the Cold War era, from the Middle East to Vietnam. Nearly 4,500 were built, serving with the armies of some twenty nations. The Centurion's chassis was also adapted to fulfill a variety of tasks, including armoured recovery, bridge-laying and guided weapons carrier. As well as tracing the history of the Centurion, Robert Jackson's book is an excellent source of reference for the modeler, providing details of available kits and photos of award-winning models, together with artworks showing the color schemes applied to these tanks. Each section of the book is supported by a wealth of archived photographs. Robert Jackson is the author of over eighty books on military aviation, naval and scientific subjects. He was defense and science correspondent for major British newspaper publishing group. This book will be of great interest to armor modelers and historians alike.